Then you need to know you're not alone! This website is here to help you find more information regarding the dangers of these unpredictable weapons on wheels and what you can do about it. 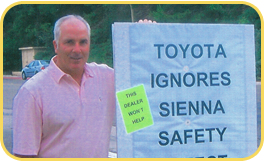 Sudden acceleration is one of the most deadly automotive defects in history. It occurs when a car’s electronics cause the throttle to go wide open, making it impossible for the driver to return the car to idle if it remains in gear. It also severely limits the ability of the brakes to bring the vehicle under control -- leaving the unsuspecting driver at the mercy of a runaway car. Thousands of people, including drivers, passengers, and innocent bystanders, have been killed or seriously injured in sudden acceleration accidents. Sudden acceleration is caused by a malfunction in the electronics that control a vehicle’s powertrain. Since the introduction of electronics into throttle control mechanisms, cases of sudden acceleration have risen dramatically. Advancements in technology have made cars safer, but vehicle electronics increase in complexity every year. As a result, the possibility of malfunction remains, and sudden acceleration is still a very real threat. Because sudden acceleration is caused by an electronic defect, it leaves no visible traces in its path. Unfortunately, automakers have seized upon that fact to blame the drivers; innocent people have even been deemed criminally responsible as a result. Car companies often claim that sudden acceleration is the result of driver error, but there is no evidence to support this claim. When does sudden acceleration occur? A sudden acceleration may occur at any time during the drive cycle. Prior to 1995, the majority of occurrences happened when the vehicle was at a standstill and shifted from park to drive. Since then, because of design changes in vehicle electronics, most occurrences happen while the vehicle is under way. Any number of driver inputs can give rise to sudden accelerations, such as shifting gears, applying the brakes, disengaging the cruise control, etc. These conditions can cause a disturbance in the electrical current and trigger a dangerous malfunction. What kinds of cars are susceptible to sudden acceleration? Most cars on the road today are susceptible to sudden acceleration. Sudden acceleration incidents emerged around the time electronic speed control was introduced, and persist to this day. The phenomenon has been reported in virtually all makes and models of vehicles, from the late 1970s to current model year vehicles. Sudden acceleration is often reported in brand new vehicles, and most commonly occurs within two years of a car’s manufacture. What should you do if you experience sudden acceleration? Put the car in neutral. No matter the RPMs of an engine, a car cannot accelerate without being in gear. If putting the car in neutral fails, shut off the engine (NOTE, shutting off the engine while a car is moving can be dangerous, as you will lose power-steering and brake-assist…. this method should be a last resort only). Once you have the car under control, shift it to park and turn off the engine. This should clear the fault. 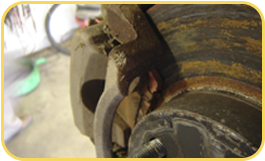 In many cases of sudden acceleration, the brakes alone are not enough to stop a car at wide open throttle. As a result, shifting to neutral is always the best option. If your car has suddenly accelerated on more than one occasion, you should not drive it! A significant percentage of automobiles that have experienced one sudden acceleration will experience repeat sudden accelerations. Nevertheless, the driver will be told by dealerships that there is no problem with the vehicle because car companies have never informed the dealers about the root cause. What is being done about sudden acceleration? We are actively involved in researching the causes of sudden acceleration in virtually every model on the highway. If you have been injured as a result of a sudden acceleration, your case may provide us with valuable additional information, and may help to save lives. Please send us your information using the ‘Contact Us’ form located below.